Following is a glossary of terms with detailed explanations on facility information. Please use the links to the right to move down the page directly to the terms you are looking for. Advertising: For product and services promotion contact the General Manager. Alcohol (non) Sections: There are six sections in Harbour Station that are designated as non-alcohol; Sections D, E, L, 5, 6, 15. At no time is a guest permitted to bring alcohol into these seating areas. Please advise Box Office at time of purchase if you wish to be located within these sections. Animals: Only seeing-eye dogs and canines required for assisting physically challenged guests are allowed in the building. ATM'S: Located on the concourse level by the main entrance doors. Automobile Problems: Guests with minor car problems (dead battery, keys locked in car, etc.) should contact a parking attendant for assistance. Babes in Arms: Any child under the age of 2 does not require a ticket to an event if they are sitting in the parents lap. Once a child reached their second birthday they require a ticket whether they sit on the parents lap or not. This policy INCLUDES the Alpine Room and all suites. Balloons: HELIUM BALLOONS are NOT PERMITTED inside Harbour Station. Barbeques: Barbeques and other open fires (gas, charcoal, etc.) are not allowed on Harbour Station parking lots or grounds. Camera Policies: This varies from event to event. Non -professional cameras are permitted at some events, but each event has its own policies. Audio and Video recording devices are NOT permitted for any event. Please call the Box Office for specific event policy. Cellular Telephone Service: Reception is generally good for most cell phone signal providers. Customers of BELL Aliant can expect a very good signal due to internal boosters. Concessions: Food services are available at 7 locations on the concourse, including TIM HORTON'S. Disability Services: There are 15 allocated parking spots for Wheelchair access passes in the East Parking Lot as well as a wheelchair drop off ramp directly in front of the building. There are 18 permanent wheelchair access-seating spaces located on the concourse level. All washrooms have barrier free access. The passenger elevator services all floors. Please contact the Box Office for more information requiring special needs. 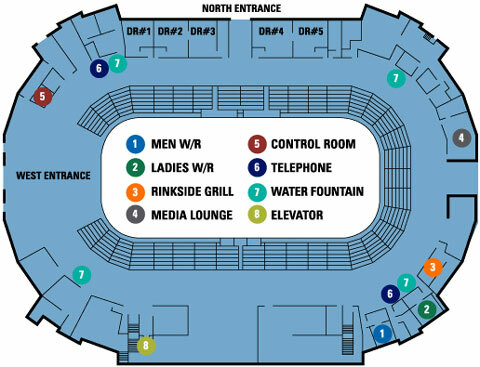 Dressing Rooms: There are 5 dressing rooms located on the north arena level. Patrons access the dressing rooms from the west arena door adjacent to the parking lot. Elevator: Located off the main lobby and at the end of the pedway serving all 4 levels. Emergencies: During events Patrons can make contact with any of the event staff to deal with emergency situations. Utilizing the public address system will be at the discretion of the Event Manager and will only be used in extreme situations. Calls into the facility to locate a patron will be dealt with by the Event Manager. Information regarding your seat location (Section, Row, Seat) should be left with your childcare provider in case you need to be found. 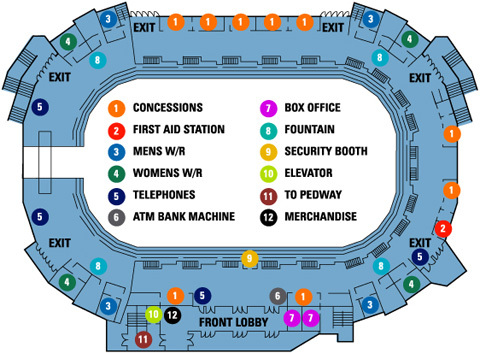 For important situations during events, staff can be located at the Sound Booth on the Concourse Level. Employment: Harbour Station is always accepting resumes for those who want to become part of our customer service team. Mail or drop off resumes to the Main Office. Event Staff: The Event Staff includes our Parking Lot Staff, Ticket Takers, Door staff, Ushers and Security. These staff members are part-time employees who work during events. Fan Courtesy: Our Patrons come to enjoy themselves. Improper conduct including over indulgence of alcohol, the use of vulgar and profane language and the throwing of objects is not acceptable. These actions can result in ejection from the building as well as potential legal charges to an individual. First Aid: Emergency Medical Personal are in the facility for most major events. Patrons requiring medical attention are asked to contact any member of the Event Staff for assistance. A First Aid room is located on the east end of the Concourse. Horns: Stadium horns are ONLY permitted during Sea Dogs games in SECTIONS 6 and 7. This policy is strictly enforced for the safety and enjoyment of all patrons and staff. AIR HORNS are forbidden in all sections. Lost and Found: Patrons who lose an item during an event can check at the Sound Booth, during and immediately following an event, to inquire about their loss. Items found and not claimed during an event or turned in during building clean up are sent to the Administration Office. Patrons may claim these items by contacting the Administration Offic,e 632-6103, during normal business hours to inquire about their loss. Merchandise Sales: Most major events offer the patron opportunity to purchase souvenirs and collectables during their shows. There are several areas on the Concourse set aside for sales. Nursing Room: There is a comfortable private room on the Arena Level reserved for nursing mothers. During some events this room may be unavailable due to security requirements. Please contact an Event Staff person for directions. Parking: There are 400 charged parking sites adjacent to the building with 1000 more sites in the general vacinity. Also if patrons are utilizing the indoor pedway connection from the uptown there are 2000 indoor and covered spaces within a 10 minute walk. Pay Phones: There are ample public telephones at both Arena and Concourse levels. They are situated by exit doors and washrooms. It is Harbour Station's right to perform personal and bag searches as required. Questions and Concerns: During events, please contact a Harbour Station Staff person and relay your concern so the situation can be addressed quickly. If it is a question then our staff will be more than happy to answer it or find a management person that can. Our Staff are there to help, please use them. Scalpers and Illegal Tickets: Scalpers and ticket brokers are not recognized ticketing agents of Harbour Station. No one other than a recognized ticketing agent is permitted to sell Harbour Station tickets on Harbour Station property. Anyone doing so will be asked to leave the premises. If you purchase a lost or stolen ticket from a non-authorized agent, then you will be evicted and the police will be called in for any potential legal charges. Smoking: Harbour Station is a non-smoking facility. Smoking is NOT permitted inside the building. Smoking is NOT PERMITTED anywhere within 33' (10m) of the facility. CLICK HERE for the Official Policy. Soliciting: Solicitation is strictly prohibited in Harbour Station during all events. No guest may distribute literature during an event without the permission of the General Manager. Sound Booth: Central and visible location on the Concourse Level where Harbour Station Staff can be reached in the event of an emergency. Tours: Tours of Harbour Station for groups or individuals can be arranged through contacting the Administration Office. 632-6103. Washrooms: The Facility has ample public washrooms and they are located in all four corners of the Concourse level. All have barrier free access. Change tables are provided in both men's and women's washrooms.